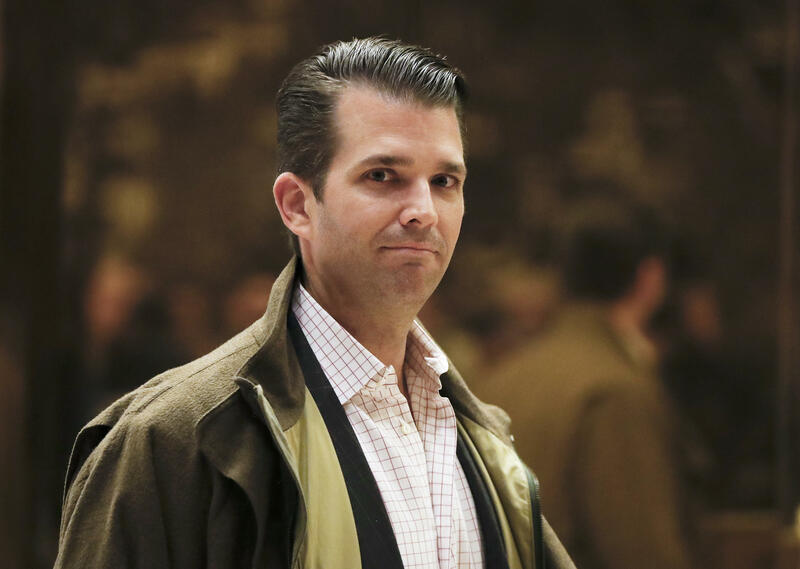 More details about Donald Trump Jr.'s meeting with a Russian lawyer during the 2016 campaign have surfaced in recent days, in the face of persistent White House denials of any collusion between Trump campaign and Russia during the election cycle. The president's eldest son has also offered a succession of responses to these developments. The New York Times first reported the meeting on July 8. On Tuesday, the Times reported that Trump Jr. had been informed that the compromising information the Russian lawyer was going to offer him on Hillary Clinton was part of the Russian government's effort to help President Trump's candidacy. Rob Goldstone, a British-born music publicist and former tabloid reporter, emails Trump Jr. saying that Emin Agalarov, an Azerbaijani Moscow-based singer and businessman Trump Jr. knew from the 2013 Miss Universe pageant in Moscow, had just called Goldstone "with something very interesting." "The Crown prosecutor of Russia met with [Emin Agalarov's] father this morning and in their meeting offered to provide the Trump campaign with some official documents and information that would incriminate Hillary and her dealings with Russia and would be very useful to your father." The email also says, "This is obviously very high level and sensitive information but is part of Russia and its government's support for Mr. Trump - helped along by Aras and Emin." "Aras" is Emin Agalarov's father, a Russian billionaire with apparent connections to the Kremlin. Aras Agalarov was responsible for bringing Trump's Miss Universe pageant to Moscow in 2013. Goldstone offers in his email to send the information to Mr. Trump, "but it is ultra sensitive so wanted to send to you first," he wrote to Trump Jr.
Trump Jr. replies, "If it's what you say, I love it especially later in the summer." Goldstone emails Trump Jr. again and says Emin asked that he schedule a meeting with Trump Jr. and "the Russian government attorney" who is flying over from Moscow on the following Thursday. On the day that Mr. Trump clinched the Republican nomination, as The Washington Post's Phillip Bump pointed out, Mr. Trump promised to give a "major speech" within days that would be "very informative" on the topic of the Clintons. "I am going to give a major speech on probably Monday of next week and we're going to be discussing all of the things that have taken place with the Clintons," he said. "I think you're going to find it very informative and very, very interesting." That speech would have taken place four days after Trump Jr.'s meeting with Veselnitskaya. Donald Trump Jr. meets with Russian lawyer, Natalia Veselnitskaya, who has ties to the Kremlin, at Trump Tower. Campaign chairman Paul Manafort and Mr. Trump's son-in-law, Jared Kushner, also attend the meeting. Veselnitskaya told NBC News that she "never had any damaging or sensitive information about Hillary Clinton," and "it was never my intention to have that." She also denied having any connections to the Kremlin. Veselnitskaya also said that Kushner was only present at the meeting for the first 7-10 minutes and Manafort looked at his phone during the meeting and did not actively participate. A month after Trump Jr.'s email exchange and subsequent meeting with Veselnitskaya, he appeared on CNN. The Democratic National Committee (DNC) emails had just been leaked, an episode the intelligence community later blamed on the Russians. Robbie Mook, Hillary Clinton's campaign manager, had just been interviewed about the leak and suggested that experts were pointing toward Russians as the perpetrators of both the hacking and the leaking of the DNC emails. He also said that the experts thought the actions could be part of a plot to help Mr. Trump and hurt Hillary Clinton. In response, Trump Jr. told CNN's Jake Tapper, "Well, it just goes to show you their exact moral compass. I mean they'll say anything to be able to win this. I mean, this is time and time again, lie after lie after lie." He went on to characterize Mook's comments as "disgusting" and "so phony." And he said of the Clinton campaign, "They will lie and do anything to win." A few days after the election, Russia's deputy foreign minister, Sergei Ryabkov, is quoted as telling the Interfax news agency that "there were contacts" with influential people connected to Mr. Trump. But his spokeswoman, Hope Hicks, denies that ever happened. "It never happened," she said, according to NBC News. "There was no communication between the campaign and any foreign entity during the campaign," a statement that was later proved wrong. Kellyanne Conway is asked in an interview on CBS's "Face the Nation" if anyone involved in Mr. Trump's campaign have any contact with Russians trying to interfere in the U.S. presidential election. Conway says, "Absolutely not. And I discussed that with the president-elect just last night. Those conversations never happened. I hear people saying it like it's a fact on television. That is just not only inaccurate and false, but it's dangerous." When Trump Jr. was interviewed by The New York Times in March, the paper says he denied participating in any campaign-related meetings with Russians. "Did I meet with people that were Russian? I'm sure, I'm sure I did," he said. "But none that were set up. None that I can think of at the moment. And certainly none that I was representing the campaign in any way, shape or form." I was asked to attend the meeting by an acquaintance, but was not told the name of the person I would be meeting with beforehand. I was asked to have a meeting by an acquaintance I knew from the 2013 Miss Universe pageant with an individual who I was told might have information helpful to the campaign. I was not told her name prior to the meeting. I asked Jared and Paul to attend, but told them nothing of the substance. We had a meeting in June 2016. After pleasantries were exchanged, the woman stated that she had information that individuals connected to Russia were funding the Democratic National Committee and supporting Ms. Clinton. Her statements were vague, ambiguous and made no sense. No details or supporting information was provided or even offered. It quickly became clear that she had no meaningful information. She then changed subjects and began discussing the adoption of Russian children and mentioned the Magnitsky Act. It became clear to me that this was the true agenda all along and that the claims of potentially helpful information were a pretext for the meeting. I interrupted and advised her that my father was not an elected official, but rather a private citizen, and that her comments and concerns were better addressed if and when he held public office. The meeting lasted approximately 20 to 30 minutes. As it ended, my acquaintance apologized for taking up our time. That was the end of it and there was no further contact or follow-up of any kind. My father knew nothing of the meeting or these events. The New York Times reports that Trump Jr. had been informed by email that the compromising information Veselnitskaya was going to offer him on Hillary Clinton was part of the Russian government's effort to help President Trump's candidacy. Trump Jr. tweeted, "Obviously, I'm the first person on a campaign to ever take a meeting to hear info about an opponent...went nowhere but had to listen." He also explained in a Tweet the disparity in his two statements on the meeting as having "simply provided more details." And he tweeted that he's "happy to work with the committee to pass on what [he] know[s]." The White House says the president didn't know about his son's meeting with the Russian lawyer in June 2016 even though Mr. Trump was in New York that same day. Asked when the president learned about the meeting, deputy spokeswoman Sarah Huckabee Sanders said, "I believe in the last couple of days is my understanding." She adds, "I would certainly say Don Jr. did not collude with anybody to influence the election." Trump Jr. tweets images of his email exchanges with Rob Goldstone here and here that led up to the meeting with Veselnitskaya. He said in his tweet that he was releasing all of the exchanges in the interest of being "transparent." New York Times Deputy Managing Editor Clifford Levy tweeted that Trump Jr. posted the emails "after being informed that the New York Times was doing a story on them." Trump Jr. also accuses the media and Democrats of being "extremely invested" in the Russia storyline.